It is widely understood that nuclear weapons have only been used twice in wartime and with terrible consequences. Often overlooked is the fact that they have been “used” elsewhere—through more than 2,000 nuclear test explosions by at least eight countries since 1945. These nuclear test explosions have been used to develop new nuclear warhead designs and to demonstrate nuclear weapons capabilities by the world’s nuclear-armed states. The tests, particularly the atmospheric detonations, have negatively affected the lives and health of millions of people around the globe. In response, ordinary citizens, scientists, legislators, and government leaders have pursued a multi-decade effort to bring into force a global verifiable comprehensive nuclear test ban. Currently, the treaty has 184 signatories and 168 ratification, though it still will not enter into force until eight key states, including the United States, ratify it. A global halt to nuclear weapons testing was first proposed in 1954 by Indian Prime Minister Jawaharlal Nehru as a step toward ending the nuclear arms race and preventing nuclear proliferation. A ban on nuclear testing has been a key national security objective of the United States since the late-1950s, when President Dwight D. Eisenhower initiated U.S.-UK-USSR comprehensive test ban negotiations. In 1962-1963, President John F. Kennedy pursued comprehensive test ban talks with Russia, but the two sides could not agree on the number of on-site inspections. Instead, the two sides agreed to the Limited Test Ban Treaty, which prohibits nuclear test explosions in the atmosphere, outer space, and underwater. Since the late-1960s, the conclusion of a comprehensive ban against nuclear testing has also been understood to be an essential part of the nuclear weapon states’ commitment to fulfill their nuclear Nonproliferation Treaty (NPT) Article VI nuclear disarmament commitments. President Jimmy Carter again sought to negotiate a comprehensive test ban treaty with Russia from 1977-1980, but that effort also fell short as U.S.-Soviet relations soured after Moscow's invasion of Afghanistan. In 1991, Soviet leader Mikhail Gorbachev announced a unilateral nuclear test moratorium. Later that year, legislation was introduced in the U.S. Congress for a reciprocal test moratorium. The legislation, which became law in 1992, mandated a 9-month moratorium on nuclear weapon test explosions. In July 1993, President Bill Clinton decided to extend the U.S. test moratorium. From 1994-96, the world's nations came together to negotiate the Comprehensive Test Ban Treaty (CTBT), which prohibits all nuclear test explosions and is intended to help curb the spread of nuclear weapons and impede nuclear arms competition. On September 24, 1996, the United States was the first nation to sign the CTBT, which prohibits all nuclear weapon test explosions or other nuclear explosions, but the Senate rejected ratification in 1999 and the treaty has yet to enter into force. In recent years, international support for the CTBT has grown and the global test ban monitoring and verification system has matured. Entry into force requires ratification by 44 specific countries listed in Annex 2 of the treaty, including the United States. In 2009, President Barack Obama vowed to pursue ratification of the CTBT, saying "After more than five decades of talks, it is time for the testing of nuclear weapons to finally be banned," but unfortunately ultimately did not pursue ratification, though the United States did pursue the first UN Security Council resolution supporting the treaty. The Trump administration's 2018 Nuclear Posture Review noted that it would not seek ratification of the CTBT, but would support the Comprehensive Test Ban Treaty Organization and the International Monitoring System (IMS) and International Data Center (IDC). The following are key events in the history of nuclear testing and the nuclear test ban. 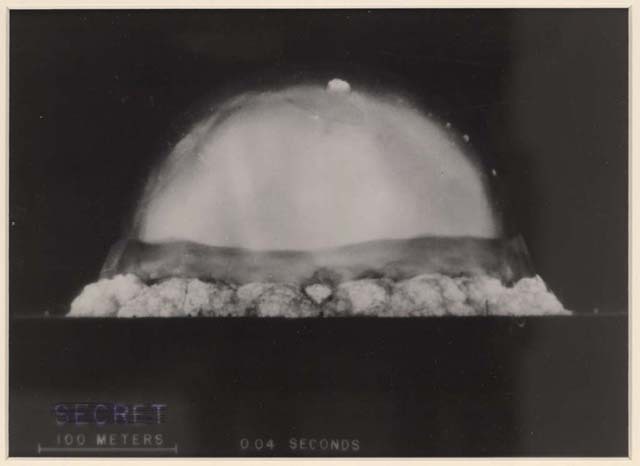 July 16, 1945: At 5:30 a.m. near Alamagordo, New Mexico, the United States conducts the first ever nuclear test explosion, code-named Trinity. August 6 and 9, 1945: The United States drops atomic bombs on Hiroshima and Nagasaki, leading to over 340,000 casualties by 1950. 1946-1962: The United States conducts 193 atmospheric tests, mainly in the Pacific and Nevada, involving over 200,000 military and civilian personnel of which, 2,000-3,000 military personnel were used as subjects of government-sponsored medical research. Thousands of other civilians and soldiers are also directly affected or involved in test explosions conducted by other nuclear powers. August 29, 1949: The Soviet Union conducts its first nuclear test explosion, accelerating the nuclear arms race. By 1962, the Soviet Union explodes a total of 142 atmospheric nuclear tests. Back to top. October 3, 1952: The United Kingdom conducts its first nuclear test in Western Australia. November 1, 1952: The United States’ Ivy Mike nuclear test, the first test of a hydrogen bomb, results in a 10 megaton explosion, which obliterates the island of Elugelab in the Marshall chain in the Pacific. 1954: The United States’ Castle test series and Soviet tests in Siberia arouse international outrage about radioactive fallout, particularly after the 15 megaton Castle Bravo test contaminates the Marshall Islands and the Japanese fishing vessel, Lucky Dragon. The hydrogen bomb tests prompt the formation of the Japanese Committee Against A & H Tests. April 2, 1954: Indian Prime Minister Jawaharlal Nehru proposes a nuclear testing "standstill" agreement, which is later forwarded to the United Nations Disarmament Commission. Albert Einstein and Pope Pius XII later call for a cessation of nuclear testing. May 10, 1954: The Soviet Union proposes, for the first time by either superpower, a nuclear test ban as the initial step toward nuclear disarmament. 1957: The United Kingdom conducts its first hydrogen bomb test and the United States and the Soviet Union accelerate testing. These countries conduct 42 above ground nuclear blasts during the year. 1957: Otto Hahn, the scientist who split the uranium atom in 1938, joins eighteen of his colleagues in pledging to have nothing to do with nuclear weapons development or testing. Chemist and Nobel Laureate Linus Pauling circulates a petition calling for a test ban, which is signed by 9,000 scientists in 43 countries. The Committee for a SANE Nuclear Policy (SANE) places ads in major newspapers calling attention to the perils of nuclear war. Thousands of letters protesting continued nuclear testing are sent to President Dwight D. Eisenhower. May 1957: The United States and the Soviet Union trade test ban and weapons production cut-off proposals but fail to reach an agreement, due in part to opposition from U.S. nuclear weapons scientists. In the summer, the American Friends Service Committee, the Women's International League for Peace and Freedom, and the World Council of Churches circulate petitions calling for an end to all nuclear tests. March 31, 1958: The Soviet Union announces a unilateral suspension of testing after completing their latest series of blasts. April 8, 1958: President Eisenhower proposes a technical conference to explore test ban verification. Citizens in the United States are joined by citizens in Europe, led by the Campaign for Nuclear Disarmament, in creating a climate of support for a test moratorium and test ban talks. August 22, 1958: President Eisenhower proposes a one-year test moratorium if the Soviets also refrain from testing and the initiation of U.S.-UK-USSR test ban negotiations, which begin on October 31. 1959: Test ban negotiations continue in Geneva despite opposition from lab scientists about test ban verification. Back to top. 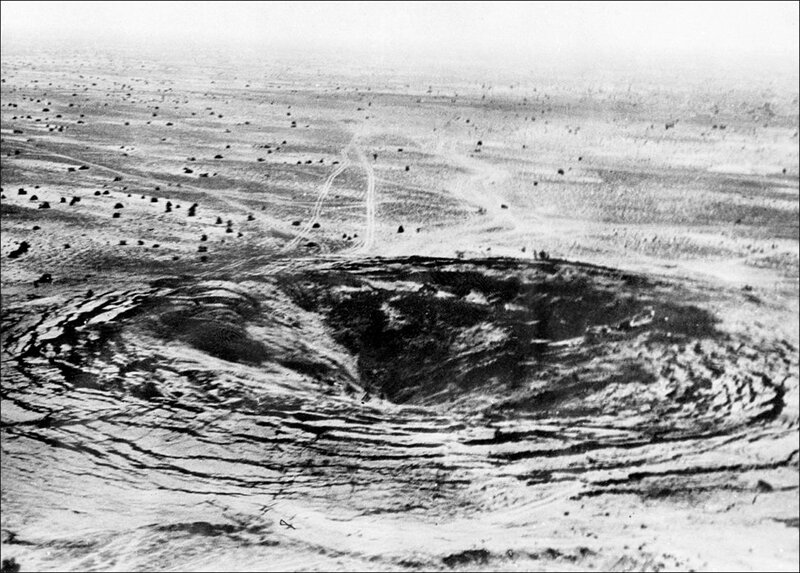 February 13, 1960: France conducts it first nuclear test explosion in Algeria. February 1960: The Eisenhower administration redoubles its diplomatic efforts by proposing a phased approach to achieving a comprehensive nuclear test ban. The proposal is endorsed by British Prime Minister Harold Macmillan, and with some further modifications, it is positively received by Soviet Premier Nikita Khrushchev, making it likely that the test ban treaty could be signed at the Paris summit that both Eisenhower and Krushchev have agreed to attend in May. However, the shooting down of an American U-2 spy plane over the Soviet Union on May 1 wrecks the chance for the Paris summit and the chance for a test ban agreement. January-July, 1961: President John F. Kennedy accelerates U.S. nuclear weapons deployments and East-West relations deteriorate over the Berlin crisis. August 1961: Soviet nuclear tests resume, followed by the resumption of U.S. testing in September. October 30, 1961: The Soviet Union conducts the largest nuclear test explosion ever—a 58 megaton atmospheric blast code-named Tsar Bomba. November 1, 1961: Approximately 100,000 women in 110 American communities leave their homes and offices in a national "strike" for a test ban, leading to the formation of Women Strike for Peace. Boston area physicians form Physicians for Social Responsibility, which documents the presence of strontium-90, a by-product of nuclear tests, in the teeth of children across the United States and worldwide. March 1962: The Eighteen Nation Committee on Disarmament (ENDC) is established. The ENDC, later to become the Conference on Disarmament (CD), will continue multilateral discussions on the test ban for over three decades. October 1962: The Cuban Missile Crisis brings the United States and the Soviet Union to the brink of all out nuclear war. November 1962-April 1963: Norman Cousins, a prominent U.S. citizen and leader of SANE, meets with President Kennedy and Soviet Premier Nikita Krushchev several times privately to urge both leaders to find a way ease tensions and break the impasse on the test ban negotiations. June 8, 1963: Soviet Premier Khrushchev invites UK and U.S. negotiators to a conference in Moscow in July to negotiate a comprehensive nuclear test ban treaty. June 10, 1963: President Kennedy accepts the Soviet invitation for renewed talks in his commencement address at American University. He argues that peace without competition between the United States and the Soviet Union is not possible, but the prevention of nuclear war is. July 15, 1963: U.S., UK, and Soviet negotiators meet in Moscow to try to work out an agreement on a comprehensive nuclear test ban. However, due to disagreements concerning on-site inspections, agreement on a comprehensive ban is not reached. Negotiators turn their attention to the conclusion of a limited ban, prohibiting tests in the atmosphere, outer space, and beneath the surface of the seas. July 25, 1963: The Limited Test Ban Treaty (LTBT) is initialed by the U.S., UK and Soviet representatives, W. Averell Harriman, Viscount Quinton Hailsham, and Andrei Gromyko, respectively. On August 5, the LTBT is officially signed by the United States, United Kingdom, and Soviet Union. July 26, 1963: President Kennedy addresses the nation on the merits of the LTBT and asks for their support in ensuring Senate approval. August 8, 1963: President Kennedy places the treaty before the Senate for its advice and consent. Citizens Committee for a Nuclear Test Ban is formed. SANE and prominent physicians place pro-ratification ads in major newspapers. September 24, 1963: The U.S. Senate votes to provide its advice and consent for ratification of the LTBT by a vote of 80 to 14. October 11, 1963: The LTBT enters into force, but nuclear weapons development and production continue with underground nuclear testing. October 16, 1964: China explodes its first nuclear bomb—a 20-kiloton atmospheric blast—at Lop Nor in northwestern China. July 1, 1968: The nuclear Nonproliferation Treaty (NPT) is signed in Washington, London, and Moscow. Among other obligations, the NPT requires parties to the treaty to "seek to achieve the discontinuance of all test explosions of nuclear weapons for all time and to continue negotiations to this end.” Back to top. September 15, 1971: Greenpeace activists sail from Vancouver to Amchitka, Alaska, intent on stopping a scheduled U.S. nuclear test, which fuels further public opposition to testing. Within a year, the United States cancels further tests at Amchitka for "political and other reasons." 1972-1974: Australia and New Zealand ask the International Court of Justice to halt continuing French atmospheric tests in Polynesia and send naval vessels to the test area to signal their opposition. Greenpeace sails into the French testing zone in protest of the explosions in what is the first of several actions against French testing. May 1974: On May 18, India conducts its first nuclear test in the Thar Desert near its border with Pakistan. Bowing to international pressure, France announces all of its future nuclear tests will be conducted underground. 1974-1976: The United States and the Soviet Union conclude the Threshold Test Ban and Peaceful Nuclear Explosions Treaties limiting military and non-military underground tests to explosive yields below 150 kilotons. However, they continue to design, develop and produce new weapons. It is not until 1990, after a stronger verification protocol is negotiated, that both treaties enter into force. 1977-1980: U.S., UK, and Soviet negotiators make substantial progress toward an agreement on a Comprehensive Test Ban Treaty (CTBT) but opposition from the Pentagon, Energy Department, and Congress, combined with the deterioration of East-West relations after the Soviet invasion of Afghanistan, scuttle the chance for a test ban agreement as well as further controls on U.S. and Soviet strategic nuclear arsenals. 1979: At a meeting organized by the American Friends Service Committee, U.S. arms control and peace groups agree to pursue a new approach on nuclear disarmament: a mutual and verifiable freeze on the testing, production, and deployment of nuclear weapons to be followed by reductions in nuclear arsenals. Later, the concept leads to the formation of the Nuclear Weapons Freeze Campaign, which merged with SANE in 1986, to form what is now known as Peace Action. Back to top. 1981: Fear of nuclear war increases as the Reagan administration embarks on massive nuclear buildup and East-West tensions worsen. A December NBC/Associated Press survey finds that 76% of the U.S. public believe that a nuclear war is "likely" within a few years. November 1981: The Union of Concerned Scientists and dozens of other citizen groups organize nuclear war teach-ins on 151 campuses in 41 states. Physicians for Social Responsibility showcase the potential devastating medical effects of nuclear war. March 1982: Sens. Ted Kennedy (D-Mass.) and Mark Hatfield (R-Ore.) introduce a nuclear-freeze resolution that is supported by 150 representatives and 20 senators. May 1982: Ground Zero national education week on nuclear war prompts thousands to sign nuclear-freeze petitions. June 1982: Approximately 750,000 people gather in New York's Central Park during the 2nd UN Special Session on Disarmament to call for an end to the nuclear arms race. July 1982: President Ronald Reagan decides to set aside the comprehensive nuclear test ban effort, calling it a "long-term" U.S. objective, which allows the United States to pursue the development and deployment of new nuclear warheads. November 1982: Voters in eight U.S. states overwhelmingly pass referenda calling for a mutual and verifiable freeze on the testing, production, and deployment of nuclear weapons. 1983: The U.S. Conference of Catholic Bishops delivers a pastoral letter calling for a halt to the testing and production of nuclear weapons, and is joined by national Protestant and Jewish organizations in support of a nuclear freeze. 1985: Arms control groups form the U.S. Comprehensive Test Ban Coalition. By 1991, the coalition includes over 75 national arms control, peace, faith, environmental, labor, and civic organizations. 1985-1987: The Soviet Union announces a unilateral test moratorium, partly in response to personal appeals to President Mikhail Gorbachev from leaders of the International Physicians for the Prevention of Nuclear War. 1986: Physicians for Social Responsibility organizes "Code Blue" congressional lobbying events on the test ban. The U.S. House of Representatives passes a non-binding resolution (224-155) led by Reps. Patricia Schroeder (R-Colo.), Ed Markey (D-Mass.) and Jim Leach (R-Iowa) calling for a one-year U.S. testing moratorium if the Soviet Union accepts on-site-inspections. 1986: U.S. President Reagan and Soviet President Gorbachev meet in Reykjavik, Iceland and discuss nuclear disarmament but fail to reach an agreement. 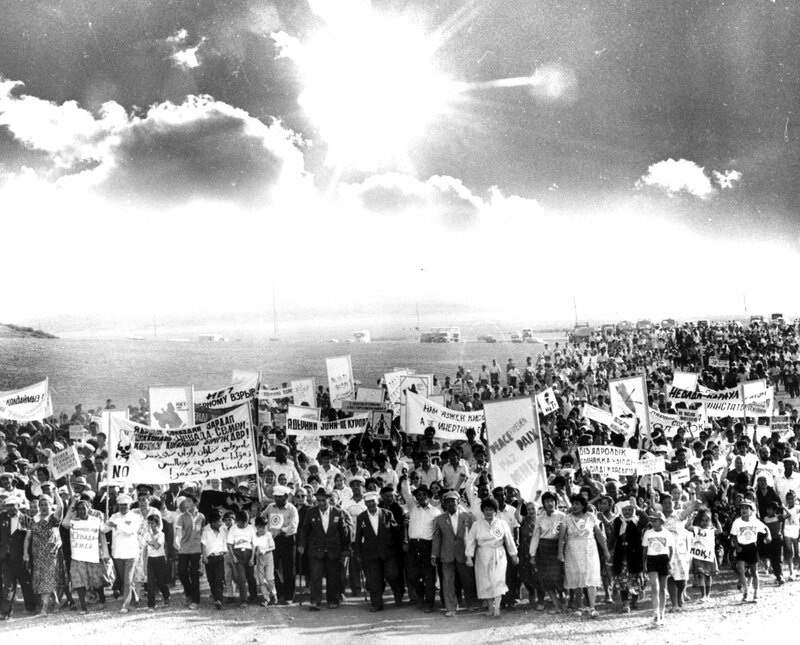 1986-1993: Annual protests at the Nevada Test Site involving 3,000 to 9,000 people maintain public awareness of the continuation of nuclear testing and weapons development. In 1988 alone, over 14,000 people attend two nuclear testing protests at the test site with over 4,000 people arrested for non-violent civil disobedience. August 1988: Six non-aligned states request a special conference to consider amending the 1963 LTBT to make it comprehensive. 1988: Physicians for Social Responsibility and five other groups sponsor the First International Scientific Symposium on a Nuclear Test Ban, in Las Vegas, Nevada. The American Medical Association and the American Public Health Associations pass resolutions calling for a CTBT. February 1989: Olzhas Suleimenov, a popular Kazakh poet and writer, forms the Nevada-Semipalatinsk Movement (NSM) in cooperation with leaders of the Western Shoshone nation to oppose further nuclear testing in Kazakhstan and elsewhere. Meetings and demonstrations are organized in many Kazakh and Soviet cities, including Moscow. The Soviets are forced to cancel 11 of 18 scheduled tests in 1989. Back to top. January 1991: The LTBT Amendment Conference convenes but no decision is made to amend the limited test ban into a comprehensive one because of opposition from the declared nuclear powers. October 5, 1991: President Gorbachev announces a unilateral, one-year moratorium on Soviet nuclear testing and invites the United States to join. Prompted by national disarmament groups and Oregon peace groups, on October 29 a bipartisan congressional coalition led by Rep. Kopetski (D-Ore.) and Sen. Hatfield (R-Ore.) introduces legislation that would impose a one-year U.S. testing moratorium. October 29, 1991: 112 Members of the House of Representatives led by Majority Leader Richard Gephardt (D-Mo.) and Rep. Kopetski (D-Ore.) introduce a bill (H.R. 3636) to establish a 1-year moratorium on U.S. nuclear weapons tests. A companion bil would later be introduced by Sen. Hatfield (R-Ore.) and others in the Senate. December 25, 1991: The Soviet Union dissolves into 12 separate republics and Gorbachev resigns as president of the Soviet Union. Boris Yeltsin assumes the presidency of the newly independent Russian state. April 8, 1992: French President François Mitterrand announces a unilateral French nuclear testing moratorium. June 1992: Russian President Boris Yeltsin extends the Soviet test moratorium. September 13, 1992: After a sustained national grassroots lobbying campaign led by disarmament groups, the U.S. Senate adopts the "Hatfield-Exon" amendment to require a nine-month U.S. testing moratorium, strict conditions on any further U.S. testing and require the start of global test ban negotiations and a prohibition on U.S. testing after September 30, 1996, unless another nation conducts a test. The test moratorium amendment is approved 55-40. On September 24, the U.S. House of Representatives adopts the "Hatfield-Exon" amendment by a margin of 224-151 and on October 2, President George H. W. Bush reluctantly signs the law containing the test moratorium legislation. September 23, 1992: The United States conducts its 1,030th—and last—nuclear weapons test explosion, a 20 kiloton detonation at the Nevada Nuclear Test Site, codenamed "Divider". January 1993: At a meeting organized by Greenpeace, Peace Action, and Physicians for Social Responsibility, pro-CTBT groups agree that in order to keep prospects for a test ban alive, the U.S. moratorium must be extended and CTBT talks must be initiated. March 3, 1993: National Security Advisor Anthony Lake orders completion of an interagency review of U.S. policy on nuclear testing and a comprehensive test ban. April 1993: CTBT advocates uncover a Clinton administration draft plan to renew U.S. testing and to substitute a one-kiloton threshold treaty in place of a comprehensive treaty. On April 30, The Washington Post broke the story, triggering national debate. Physicians for Social Responsibility, Greenpeace and other groups place pro-CTBT, "Don't Blow It Bill" ads in major newspapers. May 1993: Sens. J. James Exon (D-Neb. ), Hatfield (R-Ore.), and George Mitchell (D-Maine) and Rep. Kopetski (D-Ore.) express opposition to the one-kiloton plan. At the urging of pro-CTBT groups, they and Sen. Tom Harkin (D-Iowa) organize letters from 38 senators and 159 representatives in support of a moratorium extension and a total ban. Editorials from 46 leading newspapers almost entirely favor extending the moratorium. Polls show 72% of the U.S. public favor continuing the moratorium. June 1993: The Clinton administration debates nuclear testing policy, with the Energy Department, Arms Control and Disarmament Agency, and the White House Science Advisor favoring extension of the moratorium. 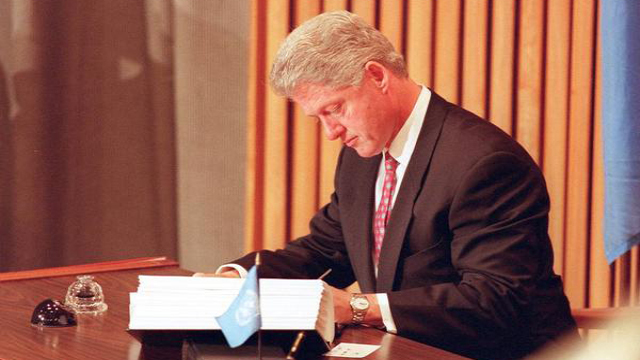 July 3, 1993: President Clinton announces he will extend the moratorium through at least 1994 unless another nation conducts a test and will pursue completion of a CTBT by September 1996. Clinton states that the current U.S. arsenal is "safe and reliable" and that there is no immediate need for further tests. August 10, 1993: The Conference on Disarmament (CD) agrees to give its Ad Hoc Committee on a Nuclear Test Ban a mandate to begin negotiations on a CTBT in January 1994. December 16, 1993: The United Nations unanimously adopts a resolution calling on the CD to proceed with the negotiation of a CTBT as rapidly as possible. January 1994: CTBT negotiations begin at the CD in Geneva. Pro-CTBT groups press negotiators to complete talks by the end of the year and begin an effort to ban all nuclear test explosions, including low-yield hydronuclear explosions. A worldwide petition drive amasses 1 million signatures for a CTBT and is delivered to the president of the CD at the outset of the negotiations. June 1994: The U.S. House of Representatives votes 263-156 on a resolution offered by Rep. Kopetski (D-Ore.), urging completion of the CTBT by the end of 1994. September 7, 1994: The CD ends CTBT talks for the year without an agreement. Pro-CTBT groups learn of a U.S. proposal to make a CTBT only 10 years long in duration and begin efforts to force the United States to withdraw the idea. January 1995: U.S. officials announce that they will pursue a test ban that is permanent in duration. CTBT talks resume in Geneva without agreement on the scope of the treaty, with the declared nuclear states favoring low-yield, hydronuclear tests under a CTBT. Australia begins a diplomatic effort to get consensus on a zero-yield test ban. March 1995: U.S. officials announce the extension of the U.S. moratorium. April-May 1995: Over 180 nations meet and agree to indefinitely extend the NPT and conclude CTBT negotiations by no later than 1996. China conducts a nuclear test one day after the conclusion of the NPT review and extension conference. June 13, 1995: Newly-elected French President Jacques Chirac announces France will resume nuclear testing before signing a CTBT, which foments international outrage and a spontaneous worldwide consumer boycott of French goods. U.S. officials debate a new proposal, backed by the Pentagon and Joint Chiefs of Staff, calling for the United States to pursue a 500-ton threshold test ban that would allow low-yield blasts. Late-June 1995: Pro-CTBT groups rally a group of 24 senators and 113 representatives to urge Clinton to reject low-yield tests and to support "a truly comprehensive test ban." July-August 1995: Over 35,000 citizens deliver calls and letters to the White House calling for a truly comprehensive nuclear test ban. The Clinton administration debates the 500-ton threshold proposal, with the National Security Council, Energy Department, Arms Control and Disarmament Agency, and White House Science Advisor favoring a zero-yield CTBT. August 8, 1995: A new technical report by former weapons scientists is released that refutes the argument that there is a need for low-yield nuclear tests. August 10, 1995: In response to constituent pressure and public opposition to French testing, the U.S. Senate unanimously adopts a resolution introduced by Sen. Daniel Akaka (D-Hawaii) condemning continued French and Chinese nuclear testing. Shortly thereafter, French President Chirac announces France will support a zero-yield test ban. August 11, 1995: President Clinton announces his support for a "true zero yield" test ban. September 6, 1995: France renews nuclear testing despite international opposition and efforts by Greenpeace vessels to reach the test zone. CTBT talks in Geneva end for the year without producing an agreement. September 14, 1995: The United Kingdom announces it will support a zero-yield CTBT. January 1996: CTBT talks resume in Geneva as India announces it will only support a test ban agreement if the declared weapon states commit to a time-bound nuclear disarmament framework. India later announces it does not intend to sign the treaty. China insists on allowing peaceful nuclear explosions. Pro-CTBT citizen groups in the U.S. and dozens of other countries write, call, and meet with CD representatives to urge completion of a zero-yield CTBT by the end of the year and to urge nations not to support India's conditions for supporting the CTBT, but rather to support disarmament through separate initiatives. Jan. 27, 1996: France conducts its last test. May-June 1996: China drops its insistence on peaceful explosions, but new disagreements emerge on verification issues and entry-into-force. Pro-CTBT groups worldwide press the declared and undeclared nuclear powers to reach agreement on verification and to support a "flexible" entry-into-force formula. June 18, 1996: The United States indicates its willingness to allow an entry-into-force formula that requires all nuclear capable states to ratify the CTBT, making a flexible formula less likely. June 26, 1996: Pro-CTBT groups rally Senate support for the CTBT and defeat the Kyl-Reid nuclear testing amendment by a margin of 53-45. The amendment authored by Sens. Jon Kyl (R-Ariz.) and Harry Reid (D-Nev.) would have allowed the President to conduct nuclear tests even under a CTBT. June 28, 1996: CD Chairman Jaap Ramaker presents a final CTBT text for member-states of the conference to consider. July 29, 1996: CTBT talks resume in Geneva. China sets off a nuclear test blast and announces it will not test after September 1996. July-August 1996: Verification disputes are settled, but India announces it will block agreement on the CTBT at the CD. August 1996: Consensus on a final CTBT text is blocked by India and Iran, ostensibly due to the failure to include pledges on disarmament. Australia intensifies its work to bring the CTBT directly to the UN for endorsement. Pro-test ban citizens’ organizations worldwide press the United States, other nuclear powers, and non-nuclear-weapon states to support the Australian CTBT resolution. September 10, 1996: With 127 co-sponsors for the Australian CTBT resolution, a special session of the UN General Assembly overwhelmingly approves the CTBT by a margin of 158 to 3, with five abstentions, opening the way for CTBT signature and ratification. September 24, 1996: The CTBT opens for signature at the UN in New York. On the first day, 71 countries sign the CTBT, including the United States. June 10, 1997: Seven U.S. senators make floor speeches on the anniversary of President John F. Kennedy's historic address at American University and call for the prompt approval of the CTBT by the U.S. Senate. July 15, 1997: In a floor speech, Sen. Pete Domenici (R-N.M.) notes, "There are certainly benefits to a comprehensive test ban treaty, but there are also costs and risks…." He also adds that he is "leaning strongly in support of the international treaty." August 1997: A "seismic event" occurs near the Russian nuclear test site at Novaya Zemlya. Initial reports suggest that the event might be a Russian nuclear test. However, the U.S. government later determines that the event occurred in the Arctic Ocean, 130km from the Russian test site, and the data suggests the event was in fact an earthquake. September 22, 1997: President Clinton transmits the CTBT to the U.S. Senate for its advice and consent for ratification. January 21, 1998: Sen. Jesse Helms (R-N.C.), chairman of the Senate Foreign Relations Committee, writes to President Clinton and argues that Senate consideration of the CTBT should wait until the Senate addresses "higher priority" issues, such as the Anti-Ballistic Missile Treaty and the Kyoto Climate Treaty. January 27, 1998: In his annual State of the Union address, President Clinton calls on the Senate to approve the CTBT in 1998 and secures support for the treaty from four former chairman of the Joint Chiefs of Staff, the nuclear weapons laboratory directors, and the members of NATO. February 10, 1998: President Clinton replies to Sen. Helms (R-N.C.) arguing that the CTBT should be ratified in 1998. April 6, 1998: The United Kingdom and France both ratify the CTBT, after jointly signing it on September 24, 1996, becoming the first two nations who have tested nuclear weapons to ratify the treaty. May 11 and 13, 1998: India, under the leadership of newly elected Prime Minister Atal Bihari Vajpayee of the Hindu-nationalist Bhara Janata Party, announces India has conducted five underground nuclear test explosions in the Thar Desert. The tests are met with global condemnation and calls for India to sign and ratify the CTBT without conditions. May 13, 1998: Sens. Arlen Specter (R-Pa.) and Joseph Biden (D-Del.) draft and circulate a resolution calling for Senate Foreign Relations Committee hearings and a vote on the CTBT "as expeditiously as possible." May 15-17, 1998: A new national opinion survey is conducted to gauge public approval/disapproval of Senate approval of the CTBT. The results show that the American public continues to support the CTBT by an overwhelming majority (73% approve of Senate ratification; 16% disapprove; 11% don't know). Among those who heard about the Indian nuclear test (63% of respondents), approval was even higher (78% approve, only 15% disapprove). May 28 and 30, 1998: Pakistan announces it has conducted six nuclear test explosions. The tests are met with global condemnation and calls for Pakistan and India to sign and ratify the CTBT without conditions. May 28, 1998: U.S. disarmament and peace groups across the country stage protests and rallies at embassies, consulates, and local Senate offices calling on India and Pakistan to stop nuclear testing and for the U.S. Senate to approve the CTBT. May-June 1998: Dozens of protests to condemn the tests are held in India involving a spectrum of prominent citizens. In addition, a new organization of professionals, the Movement in India for Nuclear Disarmament (MIND), is formed. In Pakistan, despite the imposed state of emergency banning protests following its tests, intellectuals and activists sign a petition calling for the abolition of nuclear weapons. Nongovernmental organizations and professionals hold a conference to condemn the tests by India and Pakistan and the ensuing arms race in South Asia. The Pakistani Coalition for Nonproliferation (CNFP) is formed to urge Pakistan to sign the CTBT and to take other steps to prevent an arms build-up. January-August 1999: In the late spring of 1999, Sen. Byron Dorgan (D-N.D.) and pro-treaty nongovernmental organizations redouble efforts to raise attention to the plight of the CTBT and to press the Senate leadership to begin the process of considering the treaty. July 20, 1999: A bipartisan group of nine senators hold a press briefing, citing overwhelming public support for the treaty and calling for prompt Senate action. That same day, all 45 Democratic senators write to Senate Majority Leader Trent Lott (R-Miss. ), asking for “all necessary hearings...to report the Comprehensive Nuclear Test Ban Treaty to the Senate for timely consideration” by October 1999. As he has done for nearly two years, Sen. Helms (R-N.C.) rebuffs his Senate colleagues’ request. August 1999: Most in the Clinton administration remain dubious about the prospect of real action on the treaty, and little more is done to build support. August and September 1999: Treaty opponents accelerate preparations for a possible vote on final passage. James Schlesinger, who once headed the Defense and Energy Departments, and Sen. Jon Kyl (R.-Ariz.) step up their lobbying efforts against the treaty with uncommitted Republican senators. Late-September 1999: Without information about the opposition’s lobbying effort, Sen. Joseph Biden (D-Del. ), along with other leading Senate CTBT proponents and the White House, decides to try to introduce a nonbinding Senate resolution that called for beginning the process for Senate consideration of the CTBT and scheduling a vote on the treaty by March 31, 2000. The resolution, however, was never introduced. September 29, 1999: Having been informed of the Democrats’ intention to introduce their resolution, Sens. Helms (R-N.C.) and Lott (R-Miss.) abandon their blocking strategy and propose a vote on final passage of the treaty by October 7. According to Sen. Kyl (R-Ariz.), 34 senators have already been persuaded to vote against ratification, by September 14. Lott’s initial proposal for 10 hours of debate on the treaty with only six days’ notice is not accepted by the Democratic leadership. Some Senate supporters, the White House, and the NGO community criticize the offer, calling it a “rush to judgment.” In consultation with the White House, Senate Democratic leaders negotiate for more time and a more thorough series of hearings. October 1, 1999: Senate Democrats decide to accept Sen. Lott’s (R-Miss.) final “take it or leave it” counteroffer for a vote as soon as October 12. With the final vote on the CTBT just days away, President Clinton, Secretary of State Madeleine Albright, and Secretary of Defense William Cohen finally launch a high-profile effort to win Senate support for the treaty. However, the effort was simply too little too late. By the end of October 8, the first day of Senate floor debate, the most crucial of these Republican senators have declared their intention to vote against the treaty. October 6-8, 1999: The first Conference on Facilitating the Entry into Force of the Comprehensive Test Ban Treaty, or the Article XIV Conference, is held in Vienna. Article XIV of the CTBT stipulates that if the CTBT has not entered into force three years after its opening for signature (September 24, 1996), the Depository will hold a conference, and every two years after, to facilitate the treaty’s entry into force. On the eve of the vote, Senate Majority Leader Trent Lott (R-Miss.) and Minority Leader Tom Daschle (D-S.D.) are on the verge of an agreement to postpone the vote; but Sens. Paul Coverdell (R-Ga.), Jesse Helms (R-N.C.), James Inhofe (R-Okla.), Jon Kyl (R-Ariz.), and Bob Smith (R-N.H.) reportedly race to the majority leader’s office to tell him that they are prepared to block any new agreement that would postpone the vote. October 13, 1999: The U.S. Senate rejects the CTBT by a vote of 51-48. November 10, 1999: U.S. Secretary of State Albright announces the formation of an administration-appointed task force, which will be led by retired General John Shalikashvili, former chairman of the Joint Chiefs of Staff, to work with key senators to address concerns regarding the CTBT and make recommendations about its future consideration. Back to top. June 30, 2000: Russia ratifies the CTBT. January 5, 2001: U.S. General John Shalikashvili’s report “Findings and Recommendations Concerning the Comprehensive Nuclear Test Ban Treaty” is released after a 10 month-long review of the CTBT following the 1999 Senate rejection of the treaty. Shalikashvili’s report voices strong support for the treaty and outlines measures to build bipartisan support. 2001: The George W. Bush administration announces it will not seek reconsideration of the CTBT by the Senate, but will not resume U.S. nuclear testing. July 31, 2002: The U.S. National Academy of Sciences (NAS) releases a report on “Technical Issues Related to the Comprehensive Nuclear Test Ban Treaty,” assessing the key technical issues that arose during the Senate debate over treaty ratification. The report concludes that the United States does not need nuclear testing to maintain the safety and reliability of its arsenal, that the ability of countries to cheat is limited, and that there is confidence in the ability of the verification regime to detect nuclear tests. October 9, 2006: North Korea conducts its first nuclear test explosion. Despite being only partially completed and operating in test mode, the Comprehensive Test Ban Treaty Organization (CTBTO)’s International Monitoring System (IMS) was able to detect the nuclear test and showcase the efficiency of the treaty’s verification regime. September 2008: The 2008 Integrated Field Exercise is conducted in Kazakhstan. This large-scale simulation organized by the Provisional Technical Secretariat of the CTBTO is designed to test crucial elements of the treaty’s on-site inspection provisions. May 25, 2009: North Korea conducts its second nuclear test, one month after declaring that it would no longer participate in multilateral talks on its denuclearization and would carry out nuclear and missile tests to strengthen its deterrent capability. With only three-quarters of the IMS in place, the CTBTO’s seismic stations are able to immediately confirm the nuclear test, and the noble gas system of the IMS later corroborates the seismic findings. The United Nations Security Council unanimously expands sanctions and counterproliferation measures against North Korea in response. Back to top. May 28, 2010: The 2010 Nuclear Nonproliferation Treaty Review Conference concludes and agreement is reached on a Final Document, including conclusions and recommendations regarding nuclear testing and the CTBT. February 6, 2012: Indonesia becomes the 36th Annex 2 state to ratify the CTBT, after signing on September 24, 1996, leaving eight remaining Annex 2 states needed to ratify the CTBT to bring the treaty into force: China, Egypt, India, Israel, Iran, North Korea, Pakistan and the United States. March 30, 2012: In a follow up to their 2002 report on the CTBT, NAS releases a report noting that there have been significant advancements to the technical issues related to the CTBT, particularly since the 2002 report. The 2012 report reaffirms that the United States no longer needs—and would not benefit from—nuclear explosive testing and also cites substantial advances in the U.S. national monitoring and the IMS capabilities across all of the key verification technologies deployed worldwide to detect and deter nuclear tests. February 12, 2013: North Korea conducts its third nuclear test. The test is announced by the state-run Korean Central News Agency and confirmed by the CTBTO’s IMS verification regime on the same day. August 2013: CTBTO Executive Secretary Lassina Zerbo visits China to discuss progress on CTBTO international monitoring stations in China. Following Zerbo’s meeting with Chinese Foreign Minister Wang Yi and training for Chinese station personnel in September, China agrees to begin sending data from its IMS stations to the International Data Centre in Vienna. September 26, 2013: The CTBTO creates the Group of Eminent Persons (GEM) at the United Nations in New York to bring together a group comprising of eminent personalities and internationally recognized experts to promote the CTBT’s ratification by the remaining Annex 2 states. March 19, 2014: The Times of Israel reports that Israel has strongly indicated support for the CTBT, noting that Israeli sources claim Prime Minister Benjamin Netanyahu considers the CTBT to be “very significant,” Israel is “proud” to have signed it, and “has never had a problem with the CTBT.” CTBTO Executive Secretary Zerbo also notes that "Israel could be the next" Annex 2 state to ratify the CTBT. November 3, 2014: The CTBTO Preparatory Commission launches their second on-site inspection exercise, called the Integrated Field Exercise 2014 in Jordan. The exercise involves two fictitious countries, lasts for five weeks, and uses 150 tons of equipment to comb a large swath of land next to the Dead Sea to test the procedures and operations required for a real on-site inspection of a country accused of testing a nuclear weapon. September 29, 2015: CTBT states parties meet for the 9thArticle XIV Conference on Facilitating Entry Into Force in New York. January 6, 2016: North Korea's state-run Korean Central News Agency announces that the country's military and scientific teams have conducted a fourth nuclear weapon test explosion, claiming it the test “scientifically verified the power” of a smaller hydrogen bomb that signifies a “higher stage” of development of North Korea’s nuclear force. Initial seismic readings confirm a smaller-yield nuclear test detonation but technical experts are doubtful that North Korea conducted a test of a two-stage hydrogen bomb. The detonation, at North Korea's underground nuclear test near the village of P’unggye, is immediately detected by the CTBTO's International Monitoring System and many other national and civilian monitoring stations. The nuclear test is widely condemned by North Korea's neighbors and the international community. Lassina Zerbo, Executive Secretary of the Commission for the CTBTO said in Jan. 6 statement that the fourth DPRK test should "serve as the final wake-up call to the international community to outlaw all nuclear testing by bringing the CTBT into force." September 9, 2016: Seismic activity indicates that North Korea conducted a fifth nuclear test at 9:00 a.m. local time. The CTBTO reported that more than two dozen of the seismic stations that are part of the International Monitoring System confirmed that the seismic event was in the 5.1 magnitude range, occurred at a very shallow depth, and took place in the immediate vicinity of North Korea's Pyunggye-ri test site. September 23, 2016: The UN Security Council adopted its first resolution specifically supporting the Comprehensive Test Ban Treaty (CTBT), with the vote intended to reaffirm the global norm against nuclear testing and to encourage the ratifications necessary to trigger the treaty’s entry into force. Resolution 2310, introduced by the United States, was approved 14-0, with Egypt abstaining. A total of 42 countries, including Israel, co-sponsored the resolution, which comes 20 years after the treaty was opened for signature. The resolution took note of a Sept. 15 joint statement by the five permanent Security Council members recognizing that “a nuclear-weapon test explosion or any other nuclear explosion would defeat the object and purpose of the CTBT.” By endorsing this language, the resolution affirmed the view of these five states that even before the treaty enters into force, all 183 CTBT signatories have an existing obligation not to conduct nuclear test explosions. September 3, 2017: Seismic activity indicates that North Korea conducted their sixth and largest nuclear test to date at 3:30 UTC and 12:00 noon local time. The CTBTO reported that over 100 International Monitoring System stations are contributing to the analysis. Its initial estimate is that the seismic event's magnitude was around 5.8, occurred at a very shallow depth, and took place in the immediate vicinity of North Korea's Pyunggye-ri test site. A secondary, "subsequent aftershock at same location was recorded at 2 units of magnitude smaller 8.5 mins after" the 5.8 magnitude event. On September 7, the CTBTO announced that it revised its initial magnitude estimate to 6.1. Experts assess the explosion could have had a yield in excess of 100 kilotons TNT equivalent. April 20, 2018: North Korean leader Kim Jong Un declares that he will suspend nuclear and missile tests starting on April 21 and that he will shut down the Punggye-ri test site where the previous six nuclear tests were conducted. At the nuclear Nonproliferation Treaty review conference preparatory committee meeting from April 25 - May 7, several countries call on North Korea to sign and ratify the CTBT to codify this pledge into international law. May 24, 2018: North Korea reports that it destroyed its nuclear testing site at Punggye-ri, setting off explosions to destroy the north, west and south portals to tunnels that could have been used to test nuclear weapons. It is not clear if North Korea completely destroyed the long-abandonded east portal. No nuclear experts were granted access to verify the destruction of the test site. North Korea did transport several international journalists to observe the explosions from a distance. Through nuclear test explosions, the testing nations have been able to proof-test new warhead designs and create increasingly sophisticated nuclear weapons. In 1996, negotiations on a global Comprehensive Test Ban Treaty (CTBT) were concluded and the treaty was opened for signature on September 24, 1996. The CTBT, which prohibits "any nuclear weapon test explosion or any other nuclear explosion" and established a international test monitoring and verification system, has not yet entered into force. 2. In the article "Radionuclide Evidence for Low-Yield Nuclear Testing in North Korea in April/May 2010," Lars-Erik De Geer argued that the xexon and barium isotope concentrations in air currents from North Korea in April and May of 2010 were consistent with two low-yield nuclear tests. However, this theory was largely debunked when the Earth Institute at Columbia University measured seismology records and determined that no well-coupled explosion larger than one ton could have occurred during that timeframe. According to the report, such a low yield explosion would have been incapable of advancing the North Korean's technical understanding of a nuclear weapon explosion. Despite nearly 20 years of global efforts to promote the entry into force of the Comprehensive Test Ban Treaty (CTBT), the treaty’s enactment appears a long way off. President George H. W. Bush signed into law the unilateral declaration to forego full-scale nuclear weapons testing October 2, 1992. The United States signed the CTBT on September 24, 1996, the day it opened for signature, but the Senate dealt a severe blow to the near-term prospects for U.S. participation when it refused to provide its advice and consent October 13, 1999. President Obama, however, stated in February 2009 that he intended to pursue Senate advice and consent to ratification of the treaty "immediately and aggressively." The CTBT will formally enter into force after 44 designated “nuclear-capable states” (as listed in Annex 2 of the treaty) have deposited their instruments of ratification with the UN secretary-general. To date, 184 states have signed and 168 have ratified the treaty. Yet of the 44 specified countries, India, Pakistan, and North Korea still have not signed, and only 36 have ratified the treaty. For more information on the CTBT, see Comprehensive Test Ban Treaty at a Glance. The following chart identifies the treaty’s signatories and ratifiers. States whose ratification is required for the treaty to take effect are shaded and marked with an asterisk (*). The Comprehensive Test Ban Treaty (CTBT) prohibits “any nuclear weapon test explosion or any other nuclear explosion” anywhere in the world. The treaty was opened for signature in September 1996, and has been signed by 184 nations and ratified by 168. The treaty cannot enter into force until it is ratified by 44 specific nations, eight of which have yet to do so: China, India, Pakistan, North Korea, Israel, Iran, Egypt, and the United States. The U.S. Senate voted against CTBT ratification in 1999, and though in 2009 President Barack Obama announced his intention to seek Senate reconsideration of the treaty, he did not pursue the initative, though the United States did see through UN Security Council Resolution 2310, which was the first UN Security Council resolution to support the CTBT. The 2018 Trump administration Nuclear Posture Reviews notes, "Although the United States will not seek ratification of the Comprehensive Nuclear Test Ban Treaty, it will continue to support the Comprehensive Nuclear Test Ban Treaty Organization Preparatory Committee as well as the International Monitoring System [IMS] and the International Data Center [IDC]. The United States will not resume nuclear explosive testing unless necessary to ensure the safety and effectiveness of the U.S. nuclear arsenal, and calls on all states possessing nuclear weapons to declare or maintain a moratorium on nuclear testing." In order to verify compliance with its provisions, the treaty establishes a global network of monitoring facilities and allows for on-site inspections of suspicious events. The overall accord contains a preamble, 17 treaty articles, two treaty annexes, and a protocol with two annexes detailing verification procedures. For more on the CTBT text itself, see below. For more on issues related to the treaty, see Now More Than Ever: The Case for the Comprehensive Test Ban Treaty. Article I establishes that all states parties are prohibited from conducting “any nuclear weapon test explosion or any other nuclear explosion.” On the basis of the negotiating record, this includes all nuclear explosions, in accordance with President Bill Clinton’s August 1995 “zero yield” proposal. Article II establishes the Comprehensive Nuclear-Test Ban Treaty Organization (CTBTO), which ensures treaty implementation and provides states-parties with a forum for consultation and cooperation. The organization consists of a Conference of the States Parties, an Executive Council and a Technical Secretariat. The organization, which is located in Vienna, is structurally independent from, but operating in collaboration with, the International Atomic Energy Agency (IAEA). The Conference of the States Parties is the overall governing body of the organization. It handles treaty-related policy issues and oversees the treaty’s implementation, including the activities of the Executive Council and the Technical Secretariat. The conference meets once a year, unless otherwise decided. The Executive Council, which meets regularly and acts as the treaty’s principal decision-making body, consists of 51 members. In order to distribute membership evenly throughout the world, the Executive Council comprises 10 states-parties from Africa; seven from Eastern Europe; nine from Latin America and the Caribbean; seven from the Middle East and South Asia; ten from North America and Western Europe; and eight from Southeast Asia, the Pacific and the Far East. The states in each of these geographical regions are listed in Annex 1 to the treaty. The members of the council are elected by the conference. In order to ensure that those countries with a vested interest in a comprehensive test ban are adequately represented in the council, at least one-third of the seats allotted to each region will be filled by states-parties on the basis of their nuclear capabilities applicable to the treaty, such as the number of monitoring facilities they contribute to the International Monitoring System (IMS). One seat allocated to each region will be designated on an alphabetical basis and the remaining seats will be determined by rotation or elections. Thus, each state-party will eventually have the opportunity to serve on the council. The Technical Secretariat is the primary body responsible for implementing the treaty’s verification provisions. In this capacity, it supervises the operation of the IMS and receives, processes, analyzes and reports on the system’s data. It also manages the International Data Center (IDC) and performs procedural tasks related to conducting on-site inspections. Until the treaty enters into force, these functions are being handled by the Provisional Technical Secretariat. Article III requires each state-party, in accordance with its constitutional process, to take any necessary measures to implement its treaty obligations. Article IV and the verification protocol establish the treaty’s verification regime, which consists of four basic elements: the IMS, consultation and clarification, on-site inspections, and confidence-building measures. The verification regime will not be completely operational until the treaty enters into force. For instance, on-site inspections cannot be authorized until the treaty formally comes into effect. The purpose of the IMS is to detect nuclear explosions, which are prohibited under Article I. The monitoring system comprises a network of 50 primary and 120 auxiliary seismological monitoring stations designed to detect seismic activity and distinguish between natural events, such as earthquakes, and nuclear explosions. In addition, the system incorporates 80 radionuclide stations and 16 radionuclide laboratories that seek to identify radioactivity released during a nuclear explosion. The IMS also includes 60 infrasound (acoustic) and 11 hydroacoustic stations designed to pick up the sound of a nuclear explosion conducted in the atmosphere or underwater, respectively. The host state and the location of each facility is listed in Annex 1 to the protocol. There will be a total of 337 IMS certified facilities. Information collected by the IMS is transmitted to the IDC—an essential part of the Technical Secretariat responsible for data storage and processing. Because the IMS generates an enormous amount of raw data, the IDC will regularly provide states-parties with a number of services designed to help them monitor compliance with the treaty’s provisions. In this regard, the data center produces integrated lists of all signals picked up by the IMS, as well as standard event lists and bulletins. In accordance with the parameters outlined in Annex 2 to the protocol, the center also generates standard event bulletins that screen out those events that appear to be of a non-nuclear nature. However, notwithstanding this analysis role, the IDC must make both the raw and processed information available to all states-parties. The consultation and clarification component of the verification regime encourages states-parties to attempt to resolve, either among themselves or through the organization, possible instances of non-compliance before requesting an on-site inspection. A state-party must provide clarification of an ambiguous event within 48 hours of receiving such a request from another state-party or the Executive Council. Each state-party has the right to request an on-site inspection in the territory of the party in question. The inspection request must be based on information collected by the IMS; data obtained through national technical means (NTM) of verification, such as satellites, in a manner consistent with international law; or a combination of IMS and NTM information. The request must contain the approximate geographical coordinates and the estimated depth of the ambiguous event, the proposed boundaries of the area to be inspected (not to exceed 1,000 square kilometers), the state-party or parties to be inspected, the probable environment and estimated time of event, all evidence upon which the request is based, the identity of the proposed observer (if available) and the results of the consultation and clarification process (if any). The Executive Council would make a decision on the on-site inspection request within 96 hours of its receipt from the requesting state-party. The inspection would be authorized to proceed if it has been approved by at least 30 of the council’s 51-members, the so-called “green light” procedure. An inspection team would arrive at the point of entry within six days of the council’s receipt of the inspection request. During the course of the inspection, the inspection team may submit a proposal to extend the inspection to begin drilling, which must be approved by 26 council members. The duration of the inspection must not exceed 60 days, but may be extended by a maximum of 70 additional days (subject to council approval) if the inspection team determines that more time is needed to fulfill its mandate. If the Executive Council rejects an on-site inspection request (or terminates an inspection already underway) because it is of a frivolous or abusive nature, the council may impose punitive measures on the requesting state-party. In this regard, it may require the requesting state-party to provide financial compensation for preparations made by the Technical Secretariat and may suspend the party’s right to request an inspection and serve on the council for an unspecified period of time. The verification regime also incorporates confidence-building measures intended to promote treaty compliance. In order to reduce the likelihood that verification data may be misconstrued, each state-party voluntarily provides the Technical Secretariat with notification of any chemical explosion involving a magnitude of 300 tons or more of TNT-equivalent on its territory. Each state-party may also assist the Technical Secretariat in the calibration of IMS stations. In order to ensure compliance with the treaty’s provisions, Article V empowers the conference to revoke a state-party’s rights under the treaty, recommend to the states-parties punitive measures such as sanctions or bring the case to the attention of the United Nations. Article VI describes the mechanism by which disputes pertaining to the application or interpretation of the treaty may be settled. Under Article VIII, a conference will be held 10 years after the treaty’s entry into force to review the implementation of its provisions, including the preamble. At this review conference, any state-party may request that the issue of so-called “peaceful nuclear explosions” (PNEs) be put on the agenda. However, the presumption is that PNEs remain prohibited unless certain virtually insurmountable obstacles are overcome. First, the review conference must decide without objection that PNEs may be permitted, then an amendment to the treaty must also be approved without objection at a separate amendment conference, as is explained above. The amendment must also demonstrate that no military benefits would result from such explosions. This double hurdle makes it extremely unlikely that peaceful nuclear explosions would ever be permitted under the treaty. Under Article IX, the treaty has an unlimited duration. In addition, each state-party has the right to withdraw from the treaty if it decides, “extraordinary events related to the subject matter of this Treaty have jeopardized its supreme interests.” Notice of intent to withdraw must be given at least six months in advance. Article X specifies that the treaty’s annexes, protocol and annexes to the protocol are a formal part of the treaty. Article XI declares that the treaty is open to all states for signature prior to its entry into force. Article XII maintains that each signatory state will ratify the treaty according to its own constitutional procedures. Under Article XIII, any state that has not signed the treaty prior to its entry into force may accede to it any time thereafter. Under Article XIV, the treaty will not enter into force until it has been signed and ratified by 44 states listed by name in Annex 2. These states include the five original nuclear weapon states—United States, Russia, Britain, France and China—as well as India, Israel, North Korea, and Pakistan. (Actual entry into force would occur 180 days after all 44 states deposit their instruments of ratification with the UN Secretary General.) The 44 states, all of which are participating members of the recently expanded Conference on Disarmament, possess nuclear power and research reactors as determined by the IAEA. Until entry into force, conferences may be held for those states that have already deposited their instruments of ratification to “decide by consensus what measures consistent with international law may be undertaken to accelerate the ratification process.” Since 1999, the Conference Facilitating Entry Into Force of the CTBT has been convened every other year. Article XV stipulates that the treaty’s provisions will not be subject to reservations. Article XVI establishes the UN Secretary General as the depositary of the treaty. Under Article XVII, the treaty will be authentic in six languages. the dismantlement of the Punggye-ri nuclear test site. The CTBTO and its technological tools are uniquely placed to provide adequate verification and to monitor an end to nuclear tests in North Korea. On the technical side, the CTBTO can achieve this through its competencies and capabilities in remote monitoring via the International Monitoring System (IMS), as well as through expertise in in-field activities and data collection gained through the development of the On-site Inspection element of the Comprehensive Test Ban Treaty (CTBT) verification regime. The IMS is already up and running and has detected all six North Korean tests using seismic, hydroacoustic, infrasound, and radionuclide technologies at its global network of more than 300 facilities. After each test conducted by North Korea, CTBT states-signatories received raw data and analyzed products from the International Data Centre (IDC) in a timely and reliable manner. Current developments on the Korean peninsula may provide a unique opportunity for the CTBT. North Korea is one of the eight remaining CTBT Annex 2 states, whose ratifications are needed for entry into force.3 It is vital not to miss this opportunity to demonstrate to the world the value of the treaty and the efficacy of one of the most sophisticated and far-reaching verification regimes ever devised. 1. Office of the Spokesperson, U.S. Department of State, “Secretary Pompeo's Meetings in Pyongyang, Democratic People's Republic of Korea,” October 7, 2018, https://www.state.gov/r/pa/prs/ps/2018/10/286482.htm. 2. Michael Pompeo, “Remarks with Traveling Press,” October 8, 2017, https://www.state.gov/secretary/remarks/2018/10/286490.htm. 3. Although 184 states have signed the Comprehensive Test Ban Treaty, eight Annex 2 states (China, Egypt, India, Iran, Israel, Pakistan, North Korea, and the United States) need to complete their ratification procedures before the treaty can enter into force. Lassina Zerbo is the executive secretary of the Comprehensive Test Ban Treaty Organization. Foreign ministers from the Group of Seven nations said that they regard the nuclear Nonproliferation Treaty (NPT) as “the essential cornerstone” of the nonproliferation regime a nd “a foundation for the pursuit of nuclear disarmament.” Without saying so explicitly, the language reflects their continuing rejection of the new Treaty on the Prohibition of Nuclear Weapons, even as some countries say nuclear-armed countries have not done enough under the treaty’s disarmament obligations. “While recognizing the constraints of the current international security environment, we remain strongly committed to the goal of ultimately achieving a world without nuclear weapons, to be pursued using practical and concrete steps in accordance with the NPT's emphasis on easing tension and strengthening trust among states,” according to the group statement following their April 23 meeting in Toronto.